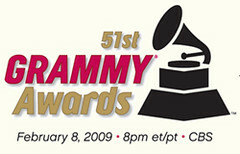 What else would I watch tonight but the Grammy's? They begin now on the East coast and an hour later here and on the west coast. Here's the list of nominees. Kid Rock is going to perform my vote for feel-good song of the year -- "All Summer Long." (No, that's not a real category, it's up for Best Male Pop Vocal Performance. His album, Rock 'n Roll Jesus is up for Best Rock Album.) The Eagles "Long Road Out of Eden" is up for a few awards, including Best Pop Vocal Album. The title song "Long Road Out of Eden" is up for Best Rock Performance By A Duo Or Group With Vocals, while "Waiting in the Weeds" is up for Best Pop Performance By A Duo Or Group With Vocals. And the album's "I Dreamed There Was No War" is up for Best Pop Instrumental Performance.